Everyone enjoys a good mystery every now and then. We try to engage ourselves with the plot by analyzing the clues the author has left behind for us to decipher in hopes that we can solve the case before the characters do. Unfortunately, if you already know the twists and turns in advance, mysteries can become a stale experience like Sherlock: A Study in Pink. Sherlock: A Study in Pink adapts the first episode of the hit BBC TV show, Sherlock, starring Benedict Cumberbatch (Sherlock Holmes) and Martin Freeman (Dr. John Watson) in manga format. For readers unfamiliar with the story, modern day London is having a strange case of “serial suicides”, where the victims don’t appear to be connected, but have all died the exact same way. With a clueless Scotland Yard at the helm and another victim added to the list, they have no choice but to defer to their “consulting detective”, Sherlock Holmes, to solve the case. Since Stevan Moffat and Mark Gatiss’ script acts as the bones of the book, it’s no surprise that the characters of A Study in Pink are still as lovable as their TV counterparts. 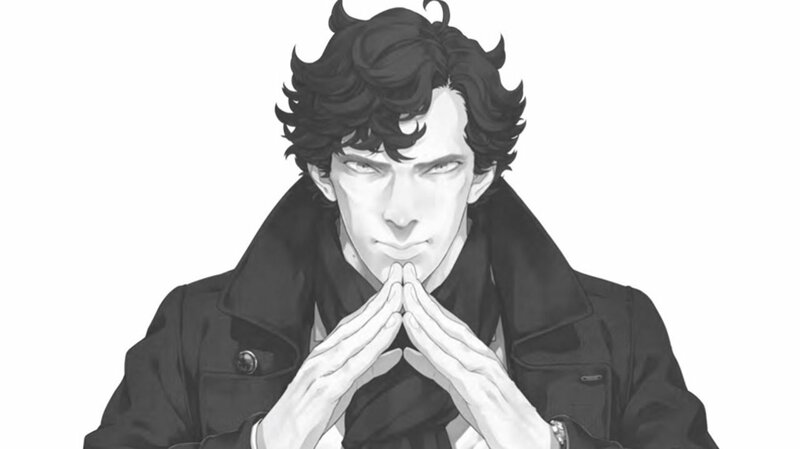 Sherlock himself is a mess of complicated genius mixed with a severe lack of social skills. He loves what he can’t immediately explain and the thrill of the chase is one of the only things keeping him from falling off the waggon. John Watson grounds the detective and acts as a sort of caretaker or parent. The doctor is somewhat of a danger seeker as well, thanks to his experiences in Afghanistan, and while he likes to keep to himself most of the times, his character truly comes to life whenever a new case arrives on the doorstep of 221B Baker St. 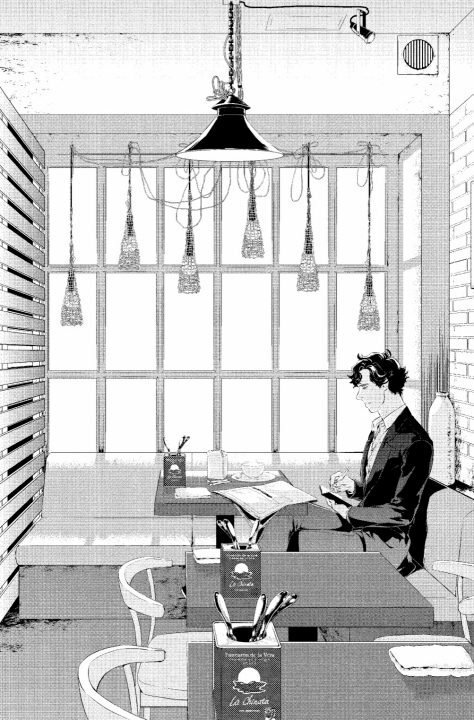 The choice to adapt Sherlock into a manga is a weird one. While I understand that there is an untapped market for thrilling mystery comics, this isn’t how I expected it to be executed. The art is minimalistic, as with most serialized manga, focusing most of the panels on the eccentric characters and their look-alike facial expressions. However, a major character is missing from the panels—London itself. With no colour pages to break up the sea of black ink, backgrounds appear drab and boring compared to the distinctive atmosphere that tourists can’t get enough of. BBC’s Sherlock is a complete package of characters, setting, music and story. This adaptation breaks that package down into only two of those key components and suffers for it. A Study in Pink isn’t something I can recommend to existing Sherlock fans because it’s a bland revisit to the fantastic TV series, but for first-time viewers, this book serves as a good primer for what they missed out on when the show was still airing. Now if you’ll excuse me readers, “the game is on” and I must get back to it.